single crochet stitches in hopes that those just starting out in crochet can make one without frustration. There will be a video tutorial right here.You can now scroll down this page for the dress pattern. 19) 1sc in each st. f/o weave in yarn tails. Place the dress onto the bunny. Take note where the middle snap closure should be sewn on making sure you have made room for the tail. Sew the snaps in place using similar color thread to your dress. 1) ch13 begin with a long starting yarn tail. You will use this yarn tail for sewing. f/o with a long yarn tail. Weave this yarn tail to the other side of the strap and knot off at the end. 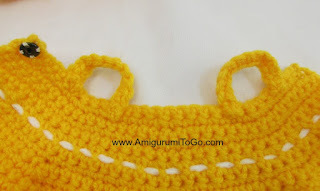 Use this yarn tail for sewing. Place dress onto the bunny and take note where the straps should go. Sew the ends of the straps in place. Make sure you have room for the arm to go through before sewing both ends in place. 1) chain about 100 -110. You can add more or less depending on desired length. f/o and leave a length for sewing. Thread the finishing yarn tail through your yarn needle and weave that in and out through the dress pulling the chain through as you weave. Go in about a half inch from the edge and finish the weaving about a half inch from the edge of the dress on the other end. Cut the yarn tails off about a quarter inch from the knot on each end of the chain. Rub a little glue on the knots if you're worried they will come loose. 11) 1sc in next st then ch8 then sl st into the 12st from the start of the chain. f/o and weave in yarn tail. And you're done. I hope you enjoyed this pattern. If you'd like to show off your Dress Me Bunny you can post pictures on my facebook page, I'd love to see! 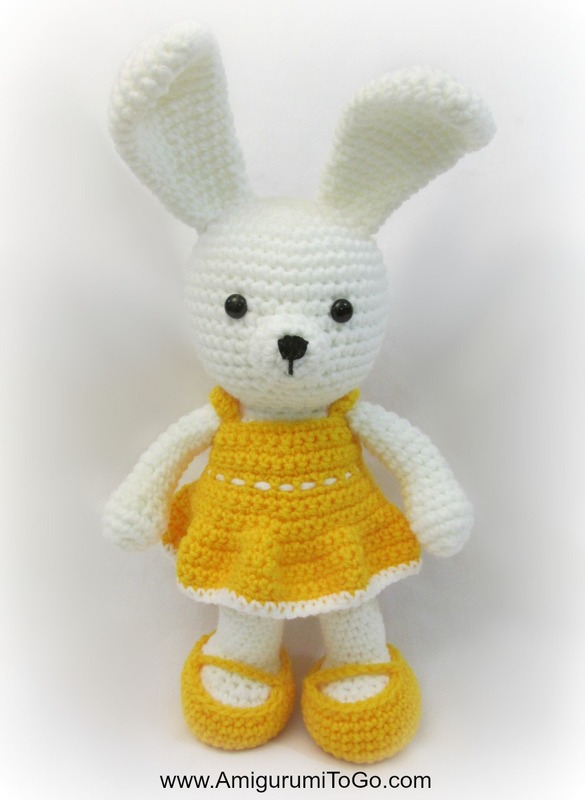 It is a really cute rabbit and it is extra sweet with dress and shoes. You make some really good patterns. They are easy to understand. I highly recommend your patterns to others. So cute! How hard would it be to change this from the waist down into shorts? I will play with it and see, I have never tried to alter a pattern before, so this should be fun. 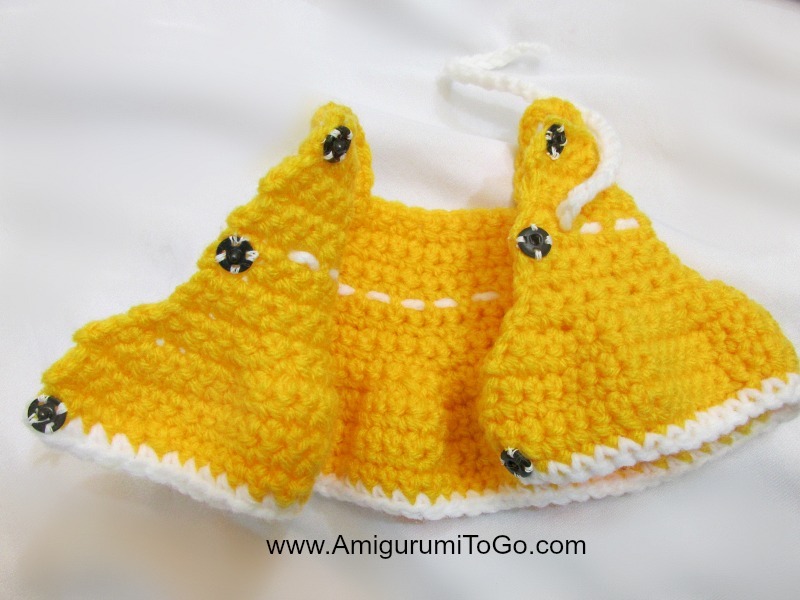 I would love to make these for my grand kids, including the boy! Thank you so much. Loved the video for the bunny. You gave me some very helpful directions. Excellent job. Love this. I'm working on two for my neighbors kids now. I was wondering, would it be hard for you to design a boy type outfit for the bunny? I see you have a vest which I'm looking at but a cute little overall set would be neat. I'm just not talented enough to modify anything to fit. I teach 567 yr olds and they will love this for Easter. Some People have the brains of which I am grateful because I can read and these things. Thank you for being such a great teacher! I love how you explain and show things as you go. I was counting my stitches wrong until you explained to look for the V. Please don't ever stop teaching! Thank you so much for sharing your designs. You are so very talented! This is so easy to do and understand thanks. Where do you get the snap closures from? OK, thank you. We don't have Walmart here in Norway, but I'll try a wool shop or a fabric shop. Or maybe I'll make some little chains and sew on some old shirt buttons?? Can you crochet an owl if you can please? All the stuff you make are so cute. I can't wait. Take your time. Love this pattern and the bunny pattern! :) such a cute and smart idea to make clothes for the bunny! I made one for my teacher's daughter and she loves it. I'll admit I made one for myself as well even though I'm 15.
the dress is so cute!! but it ended up too small for my bunny. Do you have this pattern for larger bunny as well? did you use the same yarn weight and hook size you made your bunny with? And no, this is the dress that goes with the bunny, there's no larger bunny. Hai sharon... can I know u use single yan or double yarn...? I listed what I used in the supplies list. I used a single strand of yarn, the same I made the bunny with. You can use whatever you would like to use just be sure it is the same yarn weight you make your bunny with. And if you use a single strand for the bunny then use a single strand for the dress. there is an abbreviation chart at the top of the pattern and if all else fails, a full video tutorial to follow along. so cute... thanks for the pattern. I never thought I could make the AMIGURUMIs and clothes for them, ( and my needle felted pieces ), until I found your videos on YouTube. I never comment anywhere but felt the need to tell you thank you and how much I appreciate your teaching it the way you do. You make it so easy to understand, thank you so so much. Please keep going, you make it so much fun for me ! Just finished the spring time bunny and she turned out adorably. I truly enjoyed this project. Thank you so much for sharing your talent with all of us out here. I love these patterns! Thank you so much. the dress fits the "Valentine Teddy Bear" and also the "Bee Mine Teddy Bear"
Just made the bunny, making the dress now! Would this dress fit the cuddle me puppy? ?